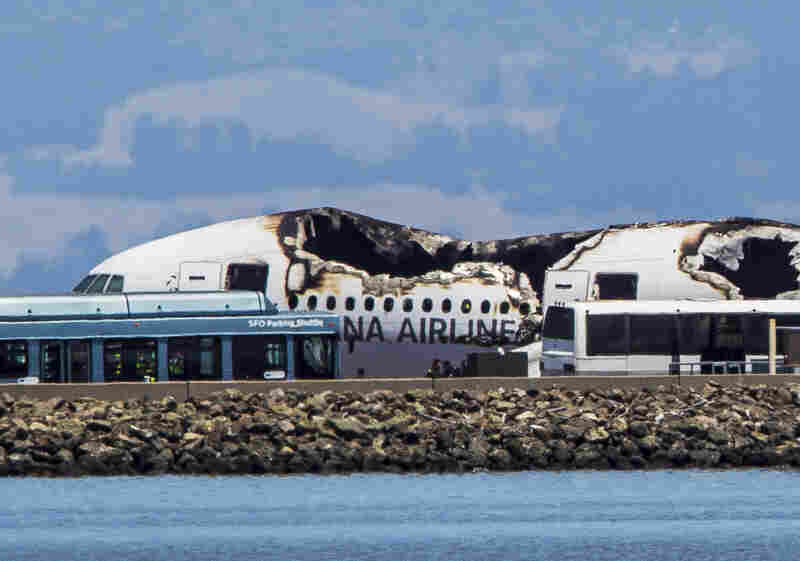 San Francisco Crash Victims Identified As Chinese Girls : The Two-Way Video reports show smoke billowing from Flight 214 and it appears to have broken into at least two large pieces. Images from the scene also show many passengers walking away from the crippled jet. 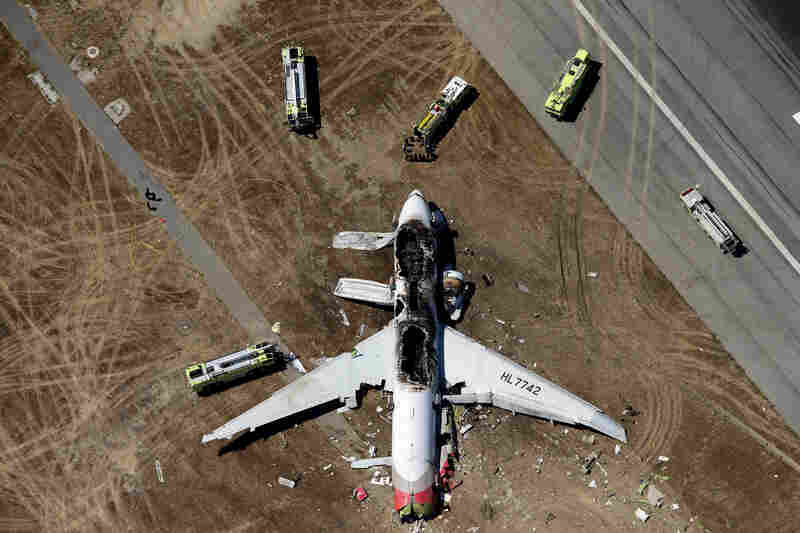 Asiana Airlines Flight 214 from Seoul, South Korea, crashed at San Francisco International Airport on Saturday. Two of the 307 people on board were confirmed dead. 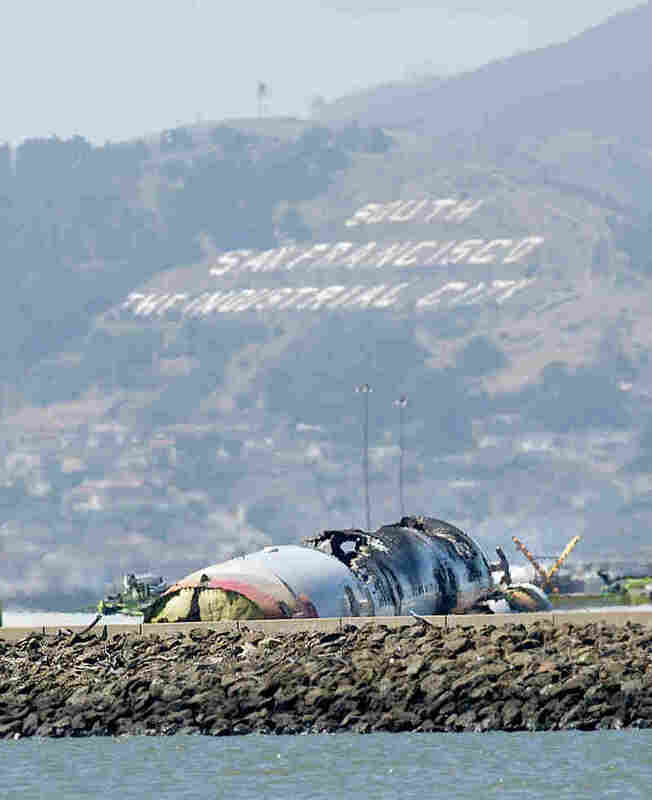 The remains of the plane lie burned on the runway after the crash. Smoke rises from the crippled Boeing 777 in this photo provided by Scott Sobczak. A photo of the aircraft provided by Zach Custer. One witness inside the terminal said travelers couldn't hear the crash, but as soon as they saw the plane "there was just a lot of uncertainty and commotion." Passenger accounts and eyewitness reports in the first hour afterward indicated that many of those on board were able to escape. Two were confirmed dead, and dozens were injured and taken to local hospitals. 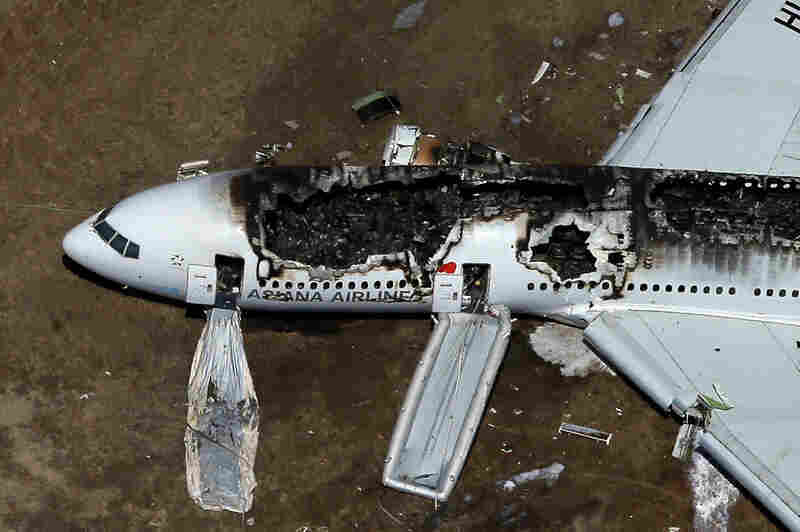 The investigation of the crash was turned over to the FBI, which said there was no indication of terrorism involved. Witnesses and passengers say the tail of the plane hit the tarmac first. 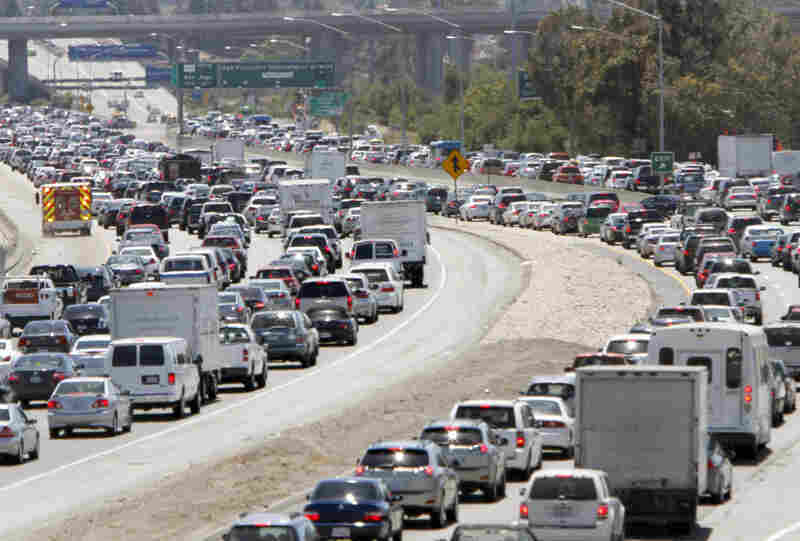 The National Transportation Safety Board said investigators were being deployed to the scene. 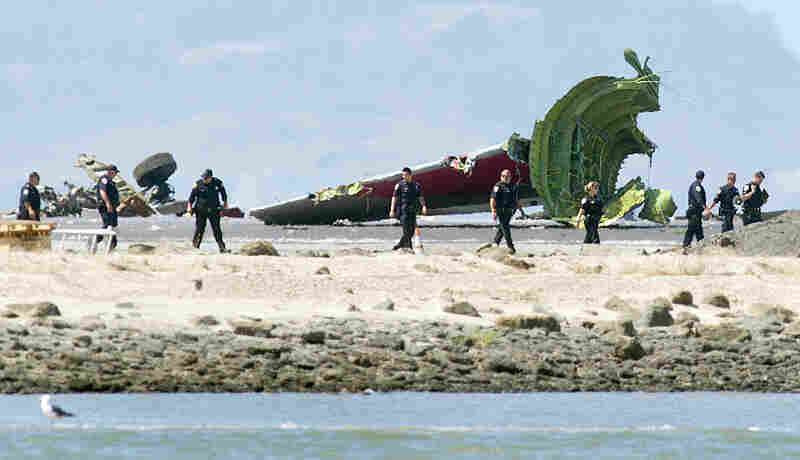 Investigators pass the detached tail and landing gear. San Francisco International Airport public information officer Doug Yakel updates the media on the status of the investigation and those who were onboard. 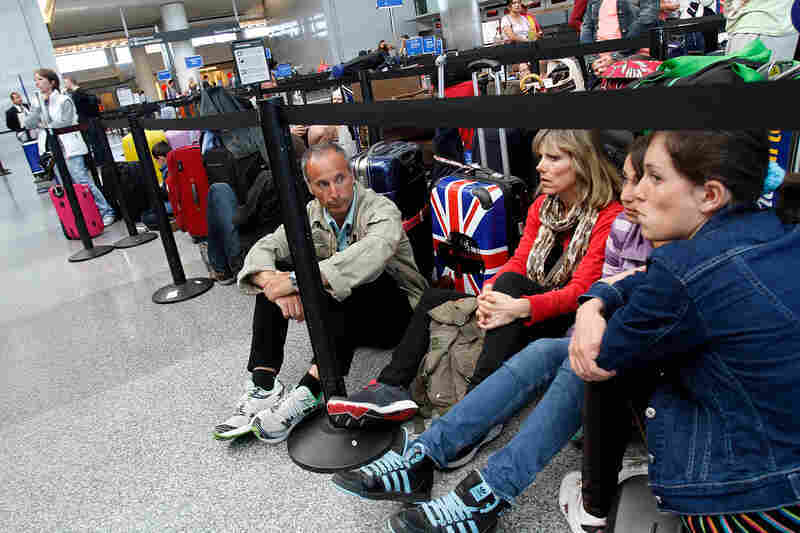 From left, Alphonse Roig, his wife Christine Roig, and daughters Nanine and Lana, wait for the British Airways counter to reopen. The family was trying to make it home to France. Traffic backs up on Route 101 after the crash. Friends and relatives await updates outside the Reflection Room at the airport. 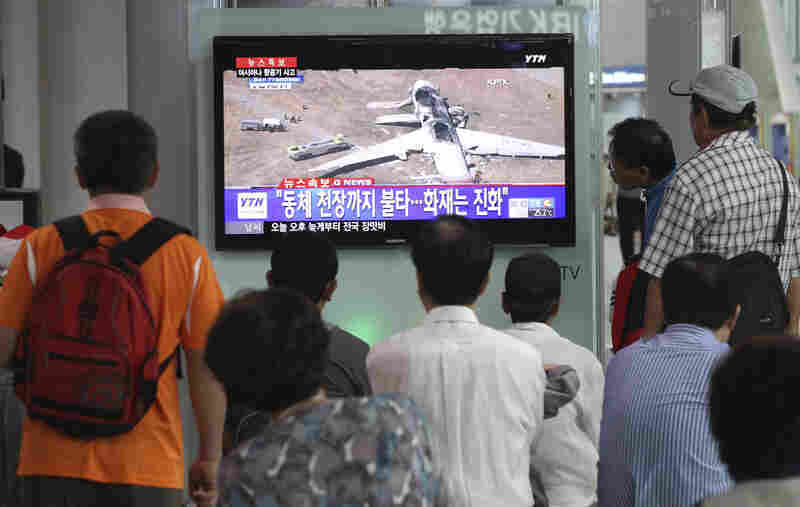 People watch a news program reporting on the accident at Seoul Railway Station in South Korea. The writing on the screen reads, "Fire on the ceiling of the airplane." A United Airlines plane taxis on the runway with the Asiana Airlines plane in the background. After initially halting all flights, the airport slowly cleared the way for some flights. Fire Chief Joanne Hayes-White said in another news conference that everyone has been accounted for, and the death toll from the accident remains at two. 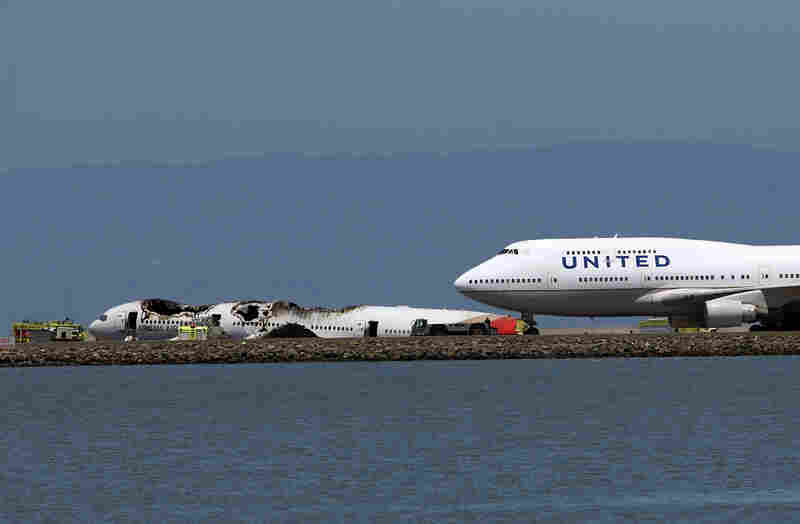 San Francisco Mayor Edwin Lee noted the "tremendous city response" to the crash, including translators dispatched from various organizations to assist the passengers and grief counselors from the health department who made themselves available on the site. The fire chief said there were 307 people on the plane, and that about 60 are still unaccounted for. She also said there are two confirmed fatalities, but that all numbers remain "fluid." At the same news conference, David J. Johnson, FBI special agent in charge of the San Francisco Division, said there was "no indication of terrorism involved." He said the FBI would continue working with the NTSB on the investigation. Krista Seiden, 26, saw the Asiana plane on the runway as she was boarding her own flight to Phoenix. The daughter of a pilot and a flight attendant, Seiden told NPR she knew it was a crash immediately: "There's really no mistaking a big commercial airliner sitting on the runway and billowing clouds of smoke." She said she saw the plane skidding along the runway, fuming with black smoke. Though they couldn't hear the crash from inside the terminal, as soon as passengers saw wreckage "there was just a lot of uncertainty and commotion." Mills-Peninsula Hospital reports having five people who were injured in the crash, but spokeswoman Margie O'Clair said "more are expected" and had no information on the patients' condition. 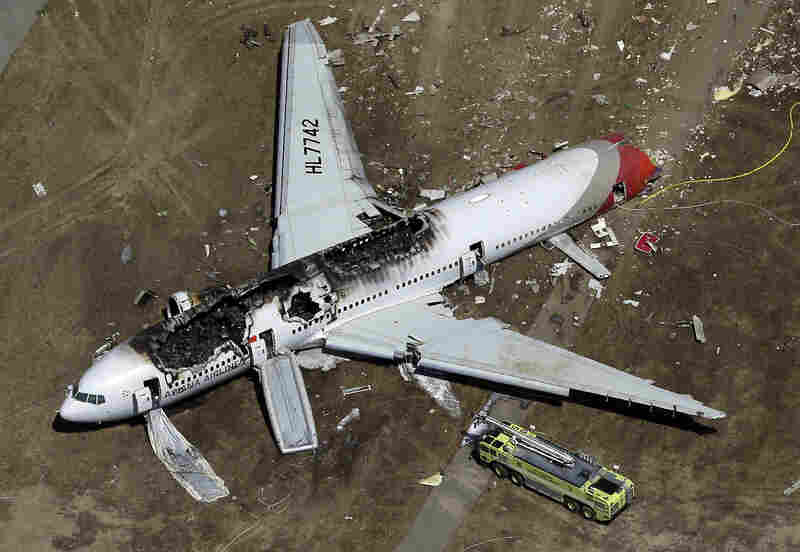 A photo that passenger David Eun tweeted shortly after, he wrote, he and others on board escaped from Asiana Flight 214. San Francisco General Hospital says it has 10 patients from the accident, eight adults and two children. "All patients are in critical condition," according to a statement from the hospital's communications officer, Rachael Kagan. 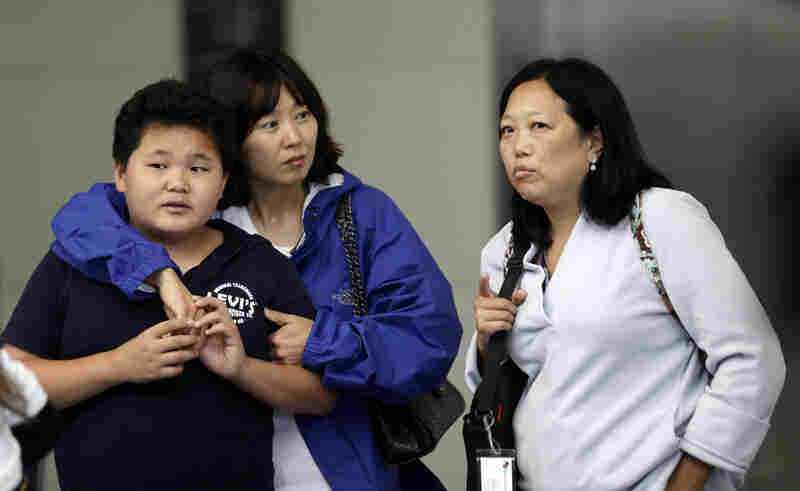 As we noted in an earlier update, the airline said 291 passengers were on board. Boeing has a considerable amount of information about the jet posted here. It comes in different configurations. The largest version can carry 365 passengers. All Things D profiled Samsung executive David Eun in December 2011. He's the person who tweeted "I just crash landed at SFO. Tail ripped off. Most everyone seems fine. I'm ok. Surreal..." and posted a photo of the crippled jet that is now going viral. 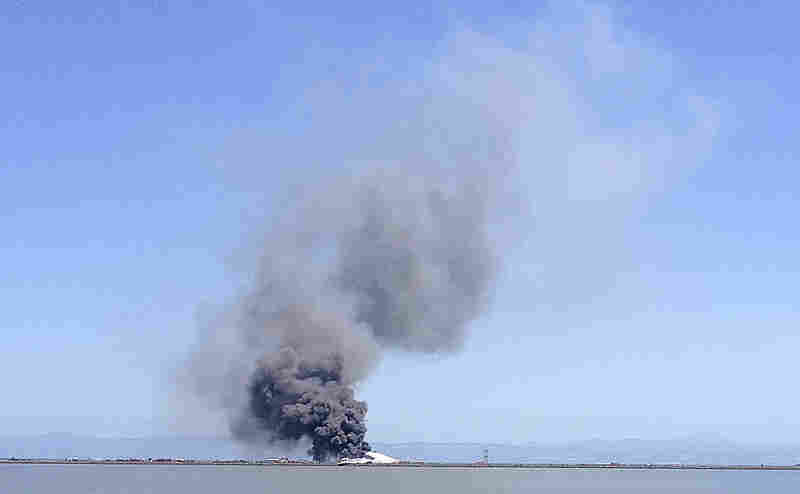 "The airline said 291 people were on board, but there was no official word on any casualties," reports San Francisco's KCBS-TV. "It's not immediately known how many casualties are involved, though televised pictures and images posted online show many survivors exiting the plane or standing outside the damaged aircraft afterward," write our colleagues on KQED's News Fix blog. "Thick smoke rose from the site of the crash on an airport runway, but the fire was quickly extinguished." 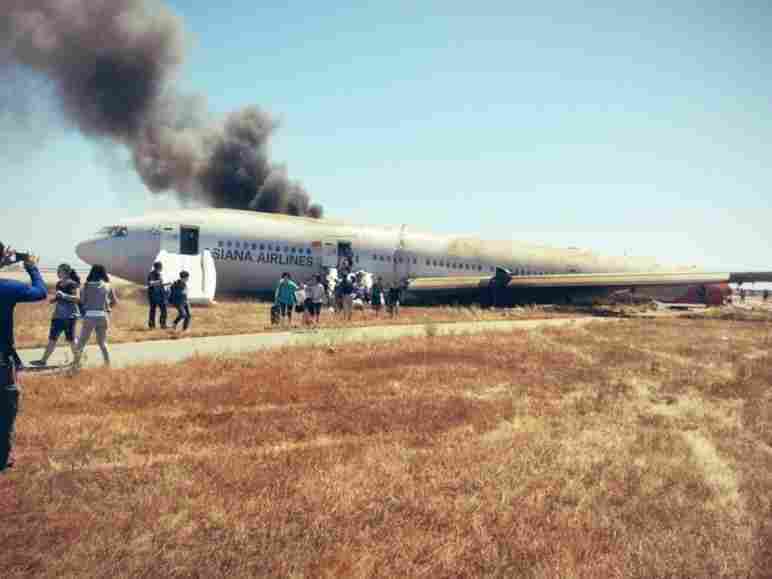 A man who says he was on board, Samsung executive David Eun, has tweeted that, "I just crash landed at SFO. Tail ripped off. Most everyone seems fine. I'm ok. Surreal..." He has also posted a photo of what looks to be the same plane that's being seen on the cable news networks' broadcasts. The photo, taken on the ground, shows a crippled Asiana Airlines jet, smoke rising, and passengers walking away. Eun has also tweeted this: "Lots of activity here. Friends, pls don't call right now. I'm fine. 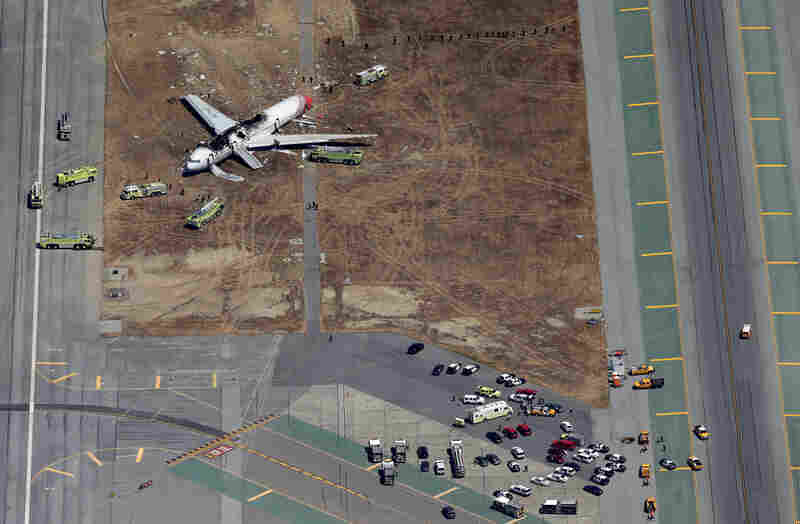 Most people are totally calm and trying to..."
It was Asiana Airlines flight 214, which was due to land at 11:28 a.m. local time (2:28 p.m. ET). 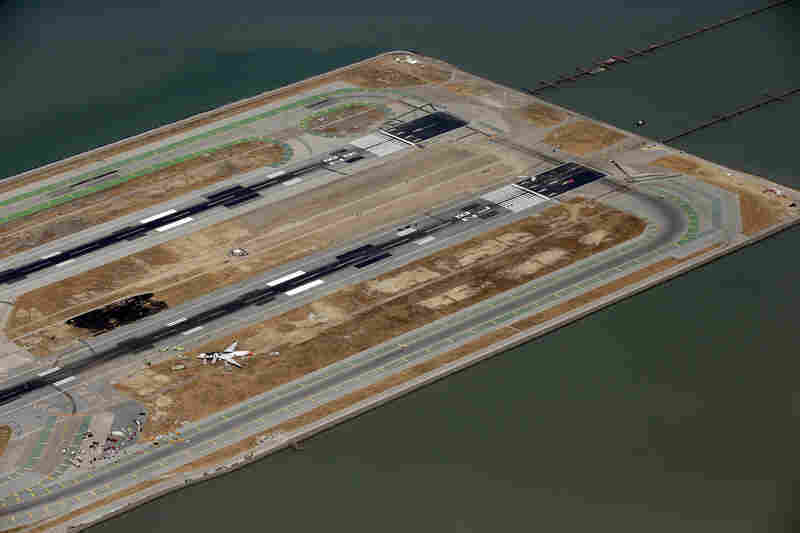 "A Boeing 777 operated by Asiana Airlines crashed while landing at San Francisco International Airport. That's all I have for now." FAA public affairs manager Lynn Lunsford emails to NPR's Daniel Bobkoff. Update at 3:22 p.m. ET. FAA Confirms, AP Reports. 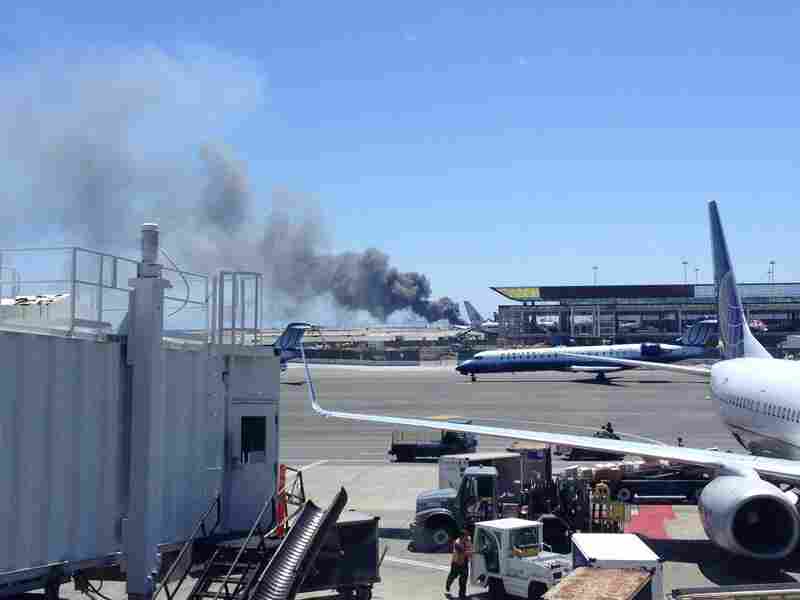 The Associated Press just moved this alert: "FAA: Asiana Airlines flight crashes while landing at San Francisco airport; injuries unknown."